Poland’s Office of Competition and Consumer Protection (UOKiK), has issued a pyramid scheme warning for FutureNet and associated companies. According to UOKiK, FutureNet and the shell companies it operates “may be pyramids”. BehindMLM has independently reviewed FutureNet, FutureAdPro and Banners App. Based on their respective business models, FutureNet and FutureAdPro are confirmed Ponzi/pyramid hybrid schemes. Banners App was launched to pump FuturoCoin, a shitcoin launched by FutureNet as part of their eventual exit strategy. On the suspicion that FutureNet and its associated companies are scams, UOKiK issued a consumer warning on March 22nd. Two shell companies tied to FutureNet have have been targeted by prosecutors in Warsaw; BCU Trading and FutureNet Ukraine. The Administrator and Service Provider of the Website is B C U Trading LLC, Abdulla Al Fahed – 4, Office No. 210, Al Qusais second, 96032 Dubai, United Arab Emirates, registered under the number 781873. With little to no active regulation, Dubai has emerged as a favorite destination for MLM scammers to set up shop. FutureNet Ukraine operates locally out of Lviv. Both companies are the subject of criminal proceedings in Poland and an ongoing wider investigation into FutureNet. Polish authorities first sounded the alarm on FutureNet back in early 2017. UOKiK is believed to have been investigating the scheme since around December that year. 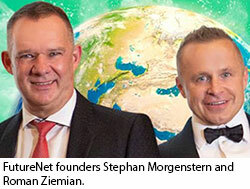 At least up until early 2019, both of FutureNet’s founders, Roman Ziemian and Stephan Morgenstern, are believed to be based out of Poland. For reasons that remain unclear, Polish authorities have not moved to detain either individual. Stephan Morgenstern is a typical serial cheater. All the projects he started in the past were based on fraud. I am a trained baker and travel agent. Wow! Gigantic! I was excited! Who would say no? It was Stephan Morgenstern himself who said “no“! With a miserable e-mail full of lies and excuses, Stephan Morgenstern has explained why his billion-dollar Network SOMNIUM has never been launched. Since the email was very long, I will publish it in the next comment. Hello! I want to know more about him. I and my friends are now being duped by him. There are still a lot of people who believe in him. I want to let them know that he is dishonest. thank you…. Gregg Evans: " Mike Bailey: Nothing will happen to PayPal because they were the ones who..."
David: "In other words, the reason they are able to do it is cause they manage to consistently..."
Oz: "Lol, they literally nuked the blog post as I doing my own research (hi guys!). I quoted the..."
Oz: "Article updated with Scoville’s granted writ submission delay." Oz: "The OnPassive website has been pulled. #RIP"
Copy Profit Success Global rebooted as FX Signal Education Plus? Riway Review: Purtier Placenta sounds gross... and costs a lot. All trademarks, logos and images are copyright of their respective owners and used under the provision of Fair Use.